There is a solar eclipse today which has everyone looking skyward. Just remember, don’t look at it directly. My huMom is going to keep us all inside until it’s over. Since we are looking up, I thought I’d show you something else to look for…but after dark. 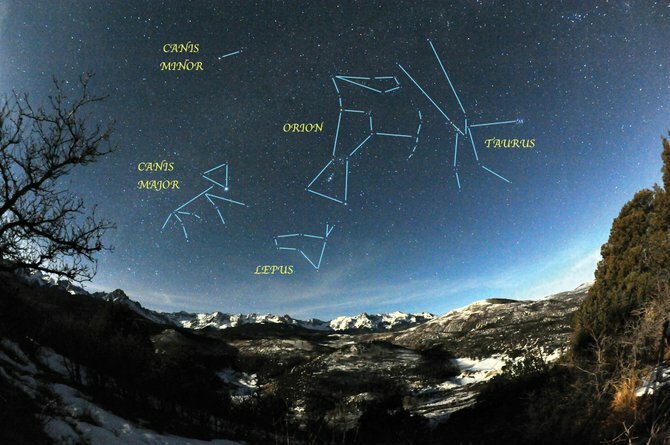 Did you know there are several dog constellations? The brightest star in the night sky is Sirius, aka the Dog Star. It belongs to the constellation Canis Major. It is one of the closest stars to the Earth. There are many tales associated with Canis Major, commonly known as one of a pair of dogs helping Orion the Hunter to pursue Taurus the Bull across the sky. Composed of just two stars, Canis Minor is most famously known as the second of Orion’s two faithful dogs. Its large star, Procyon, is the seventh brightest in the sky. Procyon means “before the dog” because in the Northern Hemisphere it rises about 20 minutes before Sirius. Canes Venatici, aka The Hunting Dogs, belong to Boötes the Herdsman, a nearby constellation. Together, they chase the Great Bear, Ursa Major, around the North Pole. The constellation didn’t start out as two dogs. In the Greek myth, Boötes wields a “club,” but an Arabic translator changed this to “spearshaft with a hook.” Then a Latin translator mistook the Arabic “kullāb” (hook) for “kilāb” (dogs). By the Middle Ages, Boötes had scored two permanent assistants named Asterion, meaning Little Star, & Chara, meaning Joy. Finally is the constellation Lupus, which began as a mythological Babylonian Wild Dog & later became a wolf. Lupus is forever doomed to be sacrificed by the nearby Centaur constellation right below it. Yikes! We dogs are truly everywhere, BOL! Some cool background on the various dog stars. Usually I can only spot the North Star but I’ll have to check on some of these. I think my eyes are too literal and I can’t ‘see’ various constellations.